We have discussed the removal process of Google Penalties previously but actually putting our methods into actions is much more interesting. This case study is based upon a large blog that received an “unnatural links to your site” penalty. The website had been going strong for many months with 150,000 monthly users and earning well above 5 figures. Therefore, this penalty really hurt the webmaster! The webmaster received the penalty on the 16th of June and waited until the 18th before getting in touch. We offer a SEO consultation service to discuss issues such as this and after discussing link building with the webmaster, it was time to begin the investigation. As the websites received an “Unnatural links to your site” penalty and not an algorithmic penalty, it saves time diagnosing the issue. Therefore, all we required was access Search Console account from the Webmaster. Export all backlink data from Ahrefs. Apart from the general link spam and a few negative SEO attempts, the website only had a handful of “good quality” natural backlinks and many guest posts. However, after further looking into the link building the webmaster has been doing, there was a further issue of over optimisation of the anchor text. If you do not know what this is, have a read of Matt Diggity’s guide. As this was only a consultation with the webmaster, we could only advise them what to do. Therefore we told them to disavow all the spam links, negative SEO attempts and low quality guest posts that were poor quality and used over optimised anchor text. 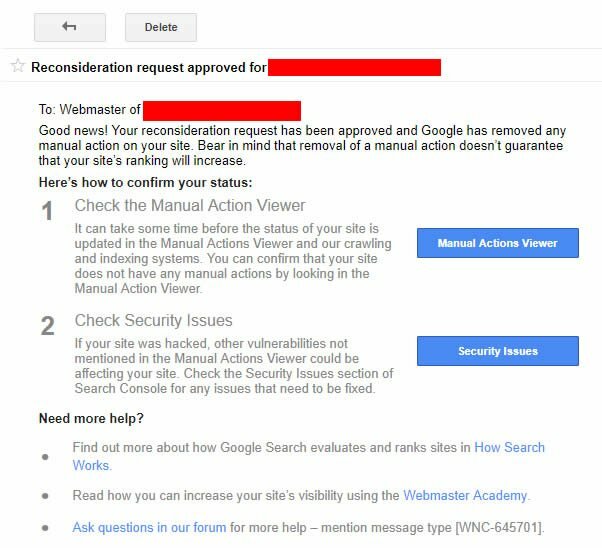 The webmaster took our advice and disavowed over 300 domains and sent a reconsideration back to Google once completed. However, 9 days later the webmaster got in touch and said their reconsideration request was denied. 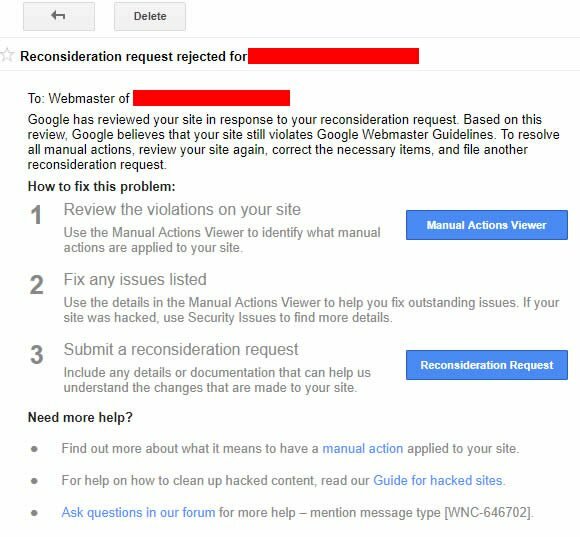 Sadly, the webmasters efforts did not result in the reconsideration request being successful. Therefore, they decided to use our Google Penalty Recovery Service to completely take control of the situation because another 10 or more days of waiting will cost them another few grand in lost profits. The first thing our team checked was the disavowed domains that the webmaster submitted and compared against the full list. This allowed us to view the existing links present that weren’t in the disavow. Straight away we saw some guest posts still present with “exact match” anchor text and a fairly poorly written article. To make things worse, there was a page on the websites with a “write for us” type of page where you pay a small fee for a “follow” link. This is an obvious example of “buying links that pass page rank” and after all, this is the reason why the penalty has been given in the first place. When contacting the webmaster regarding the few poorly written guest posts and exact match anchor text links, have a guess why they are still there … he replied “they were fairly expensive links and I didn’t want to see them go to waste“… *FACEPALM*. We then went through all the links and completed another disavow file as shown below. We also asked what they put in the reconsideration request and the response was “just that we disavowed the domains”. This again is not the way about doing a reconsideration request. 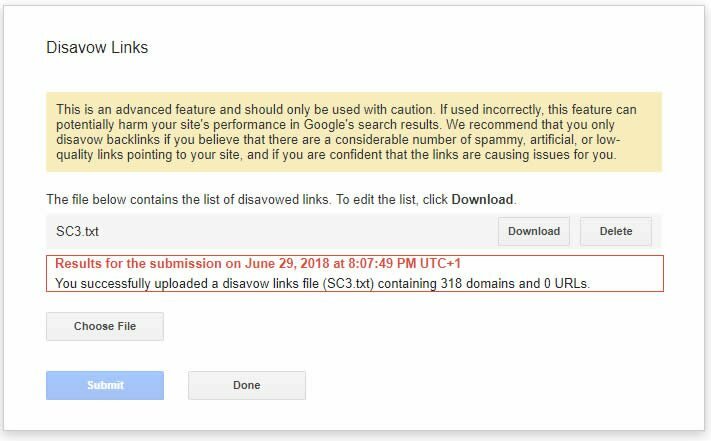 Once we had disavowed all the links and put in a proper reconsideration request, the following Search Console message appeared 10 days later. Once telling the webmaster the great news, they were ecstatic and very grateful but could still see the manual action in their Search Console and still no traffic. This is pretty standard and it can take a few days for the penalty to leave the search console and traffic to come back. 24 hours is the normal amount of time from our experience and other case studies. As you can see in the Google Analytics screenshot below, the traffic came back straight away with all rankings going back to how they were. More importantly, the webmaster informed myself that the income was back to normal too. Google are releasing their “Ban Hammer” much more frequently these days and if you are not following the Google Guidelines for link building, it wont be long until you will be found out. Poor quality and exact match anchor text on a “guest posting” type website is a clear penalty.? If you are an established business that rely on your website for revenue, you really should be using a professional SEO company to take control. This reduces the risk of a manual penalty and potential thousands or millions in lost revenue.